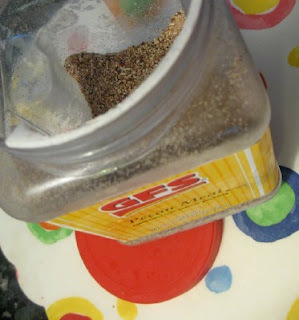 My secret weapon: a canister of pecan meal from the GFS Market. I paid about $6.50 for 1-lb, 11-oz of pure ground nuts. Keep in the freezer for convenience and freshness! What is a GFS Market, and will they ship to me? That's a great price, nothin' like real pecans in your cookies. I buy walnuts and I like them, but pecans, now, that's a luxury! Thank you for the pie recipe! I had one similar at Das Dutchmen Essenhaus earlier this Spring and wondered if they use Splenda. I can't wait to try it. I'm "catering" my son's graduation party for this weekend. It can be done on a budget because I've purchased most of the ingredients on sale and stocked up. The savings in butter alone is great. I just cringe when I see how much people pay for baked goods at the stores. Oooh! I will have to look for that! I have spent a lot of time and money at GFS in the last month getting ready for my daughter's graduation open house. I can think of lots of uses for ground pecans! My son drives a truck in East TN for GFS. There is not a retail outlet in this area, but maybe he could get these for me. I didn't know they sold pecans, but I've never been to a market. By the way, I always freeze nuts to keep them from becoming rancid. I don't know if they sell whole pecans at a very good discount. Costco has traditionally had the lowest price for pecan halves. However, finding them in this ground form was a lifesaver for me, since I make so many nut crusts. Lots less food processing to clean! I'm not sure they would be chunky enough to use in cookies, though. The texture resembles a coarse to fine meal. Oh, my gosh .. I never realized they sold ground pecans! That's perfect for my Christmas baking! Grinding nuts is a pain! Thanks! I need to find some ground up mac nuts - and soon! I have never seen pre-ground pecans...What a find! My mother makes a baked nut-meringue torte instead of crusts. Have you ever tried something similar? Egg whites, beaten stiff, fold in sugar (have never tried with sweetener) and ground pecans, then bake. Top with whipped cream and fruit or ice cream and fruit. A wonderfully dense, sweet lower-carb desert.